Los Angeles is one of the most visited cities in the world. 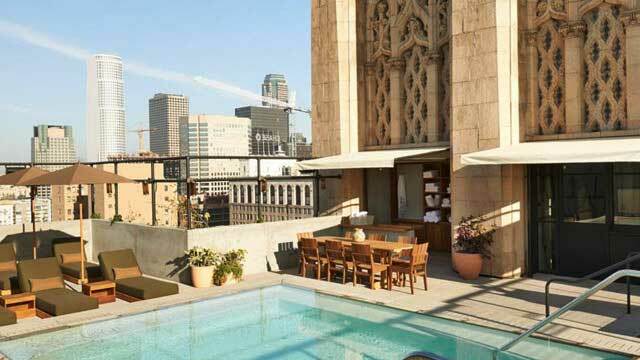 And what better way to spend your time here than at a hotel with a rooftop pool in LA. 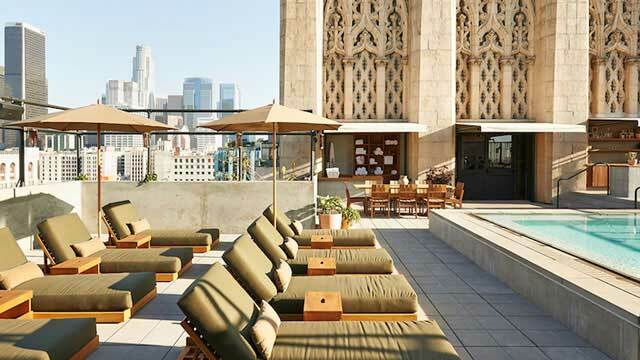 The Los Angeles rooftop pools are often located at hotels and with either sweeping city views or right next to the skyscrapers of downtown. 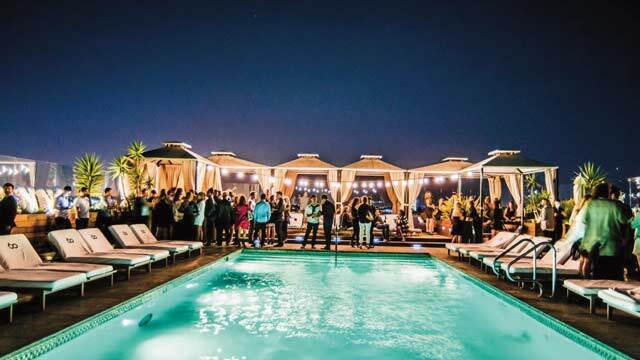 A typical LA rooftop pool hosts great parties and are a little bit more relaxed during the days. 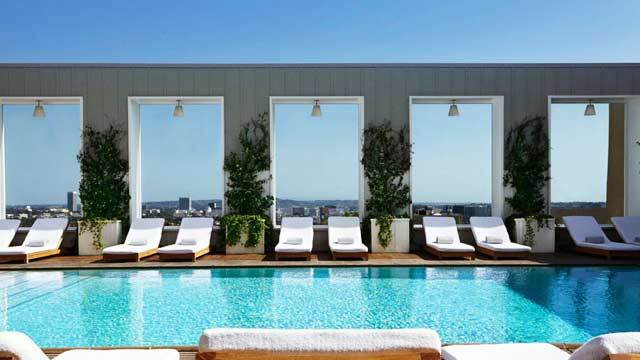 We have summoned this list of the best rooftop pools in Los Angeles, so that you can choose your hotel or party wisely. Also check out some cool places for some rooftop cinema in Los Angeles. 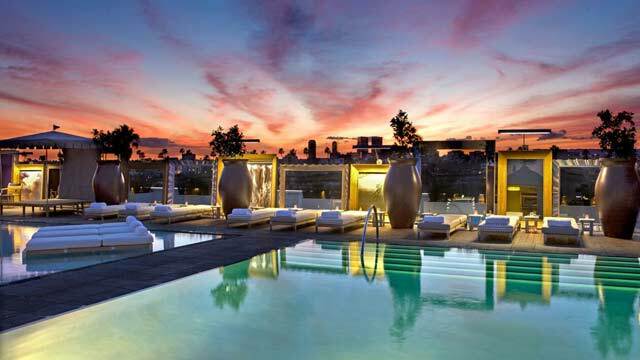 This rooftop pool in Los Angeles can boast of one of the best views in all of LA. Sweeping skyline views as far as the eye can see. 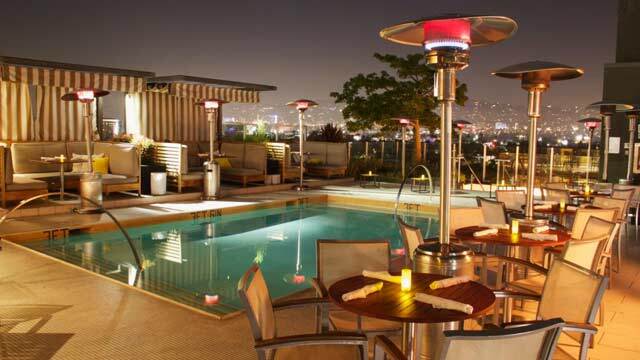 Sky Bar is a true hotspot for the LA nightlife and bar scene. During the days the atmosphere is more relaxed and calm and from late afternoon the tempo and party feeling starts to take over. 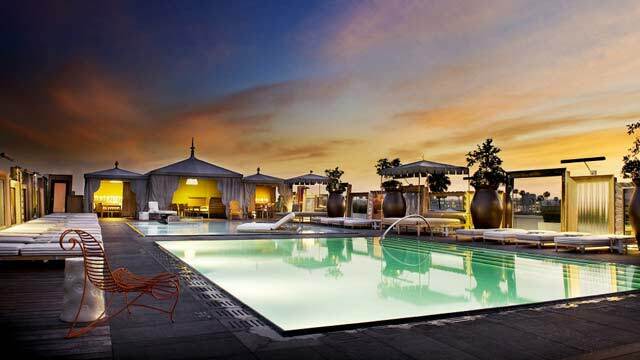 Fancy cocktails, Hollywood glamour and live DJs makes this rooftop one of the most popular and frequently visited rooftop pools in Los Angeles. 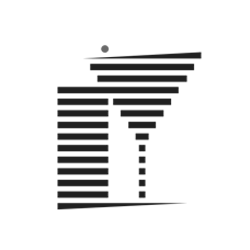 The pool area is exclusive for the hotels guests from early morning until 1:00 PM and after that, outside guest are welcome. Dress neatly and you will feel right at home here. 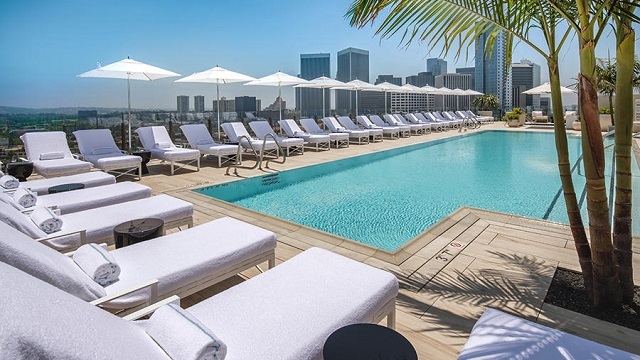 Glamour and luxury are two words that fits this LA rooftop pool. 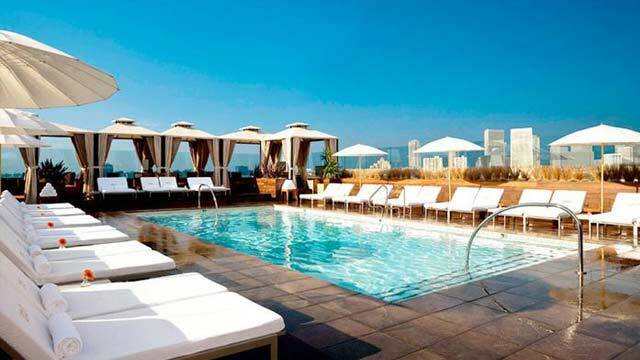 This along with breathtaking city views and attentive poolside service, makes Altitude Pool Deck one of the best rooftop pools in Los Angeles. 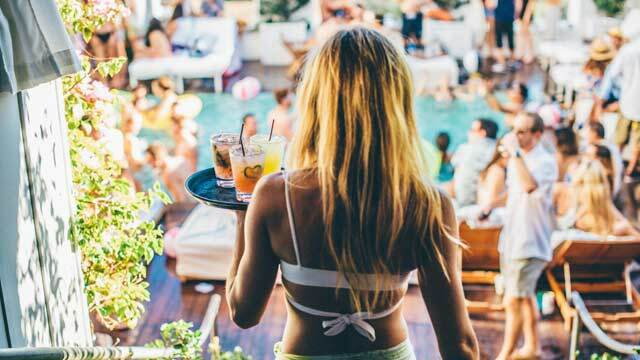 During the weekends between 2:00 PM – 6:00 PM the pool area turns into a lounge, with live DJs playing soft tunes in a party friendly atmosphere. Make sure to book your cabana in advance. For the sun loungers it’s first-come, first-serve basis. 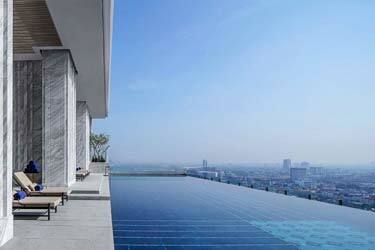 To be able to use this rooftop pool during the weekends, you must be a guest at the hotel. Otherwise it’s recommended to come here a weekday, when there’s a little less people. This LA rooftop pool is fantastic. Both for a weekend pre-party or just for relaxation during the day. The terrace is equipped with cabanas, sun loungers and regular tables with chairs. If you want most out of your visit here, you should book a cabana in advance. 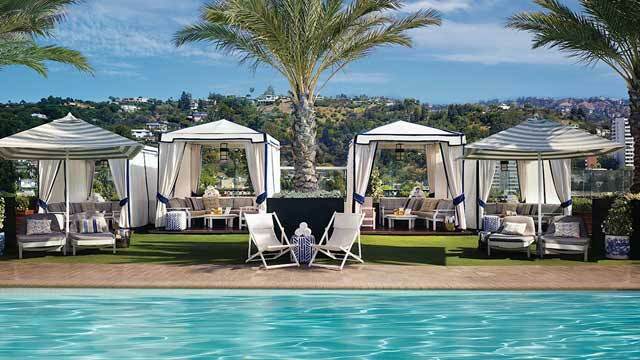 Except the beautiful view over Beverly Hills and Hollywood Hills, one of the best things about this rooftop pool in Los Angeles is the delicious food and drinks. Burgers, salads, mimosas and much more. The swimming pool is heated and open all year around. 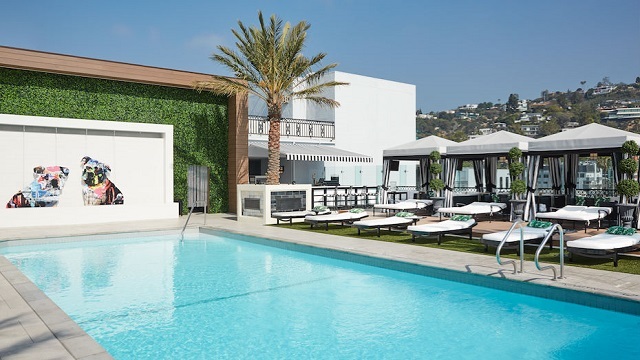 The food, 360-view, lovely swimming pool and superb atmosphere makes this place very popular and also one of the best hotels with a rooftop pool in LA. 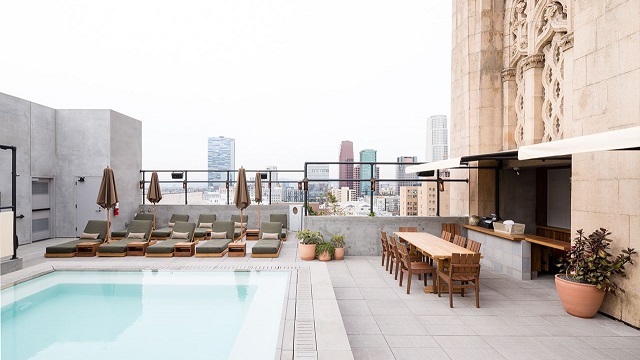 The Ace Hotel is a super modern hotel in downtown LA with a fantastic décor and art. This also applies to the pool area located on the rooftop. 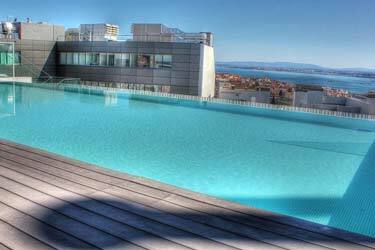 The rooftop pool is open for the public, which makes it very popular and well visited. To get a good seat, you will need to get here in good time. The terrace is quite small and the number of seats are limited. If you get a seat in one of the sofas, you are in for a treat. 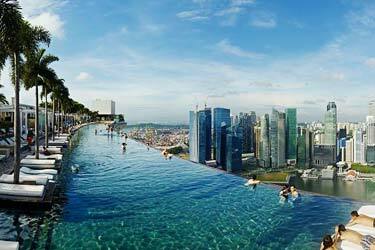 The rooftop pool is also small and many people are sitting at the edge of the pool with their feet in the water. Much because of the nice jacuzzi feeling and function. 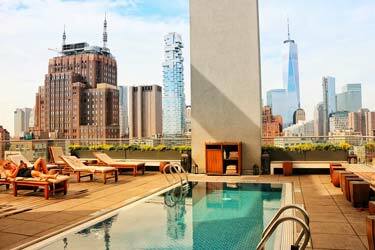 The Ace Hotel rooftop pool also have a nice party atmosphere during the weekends and evenings. If you like it calmer, you should come here before noon. With sweeping city views and a sophisticated vibe, The London West Hollywood offers a perfect oasis for fresco dining and mingling. 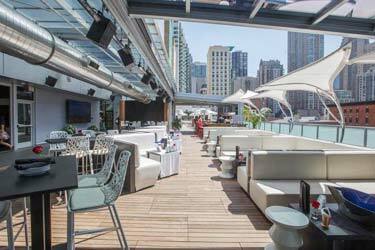 The rooftop has a series of weekly programmed events. Or how about Rosé All Day on Tuesdays, live music on Wednesdays and “Game On” Fridays featuring tabletop games. Brunch will be served to Saturday, while Sunday brunch will feature live jazz music. 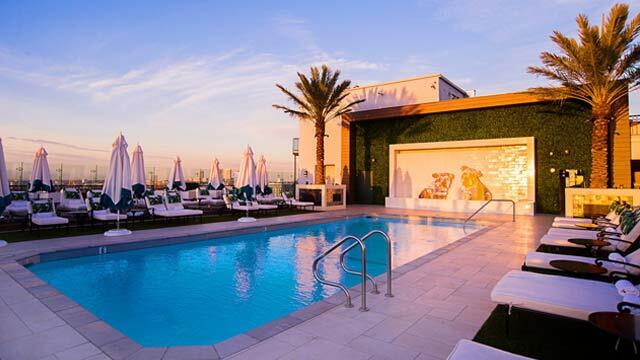 This rooftop pool LA has most of the things you can desire from a perfect rooftop venue. The London West Hollywood LA is popular both among tourists and locals, which makes it recommended to book a table in advance. 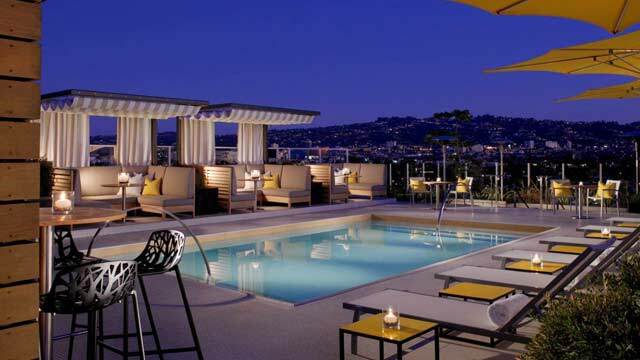 Above SIXTY is a rooftop pool in Beverly Hills with an amazing city view over Los Angeles and its surroundings. 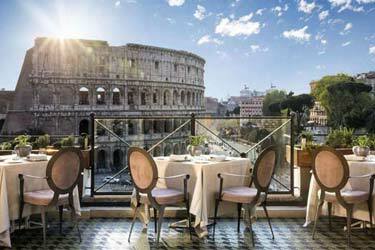 The roof terrace is equipped with luxurious cabanas, sun loungers and regular tables with chairs. 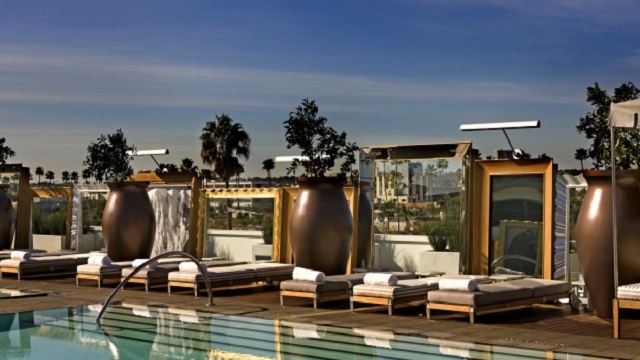 The Sixty Beverly Hills rooftop pool is very popular among celebrities. So, if you are lucky, you will bump into a movie star while having cocktails by the poolside. Both the food, drinks, atmosphere and service is top notch here. Make sure to dress for success to blend among the trendy crowd. 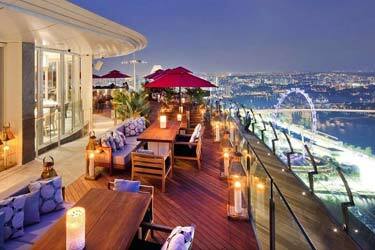 The Above SIXTY dress code is smart casual for those how will not swim in the rooftop pool. 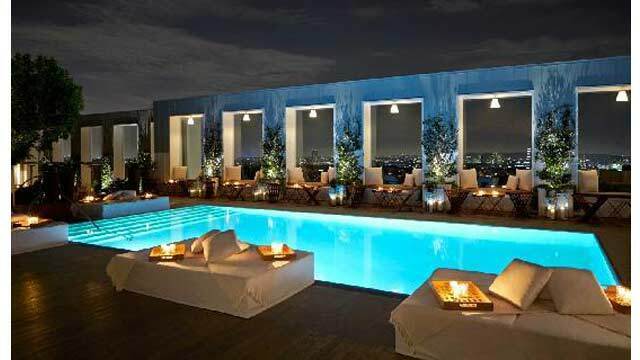 If you like luxury and party, the LA rooftop pool at Sixty Beverly Hills is well worth a visit.